When Parks and Recreation returns to NBC for its seventh and final season, it’s going to be a different show in many ways, from its shifted time frame to Leslie’s new job to her and Ben’s triplets. But it will resemble past seasons in several ways as well, specifically in some actors coming back to reprise their beloved roles. Fans can expect to see Rob Lowe and Rashida Jones returning as Chris Traeger and Ann Perkins, whom I expect are lit’rally the greatest parents in the known world. Unfortunately, we probably won’t get to spend a lot of time with the quirky couple (or whatever role each is playing in the other’s life at this point), as Chris and Ann are only confirmed to return for one episode. Will it be the final one? The two actors left the series in the middle of Season 6 – though Jones returned for another episode later in the season – and their characters are presumably still in Michigan and raising young Oliver. Considering we’re not even used to there being any children on this series, how much madness will ensue when Ann’s kid, Leslie’s kids and Ron’s kid are all in the same room? Man I hope they make the most of it. I want to see Chris as a father. What if they have more than one kid now? Eek! There are several more characters coming back to Pawnee next season. 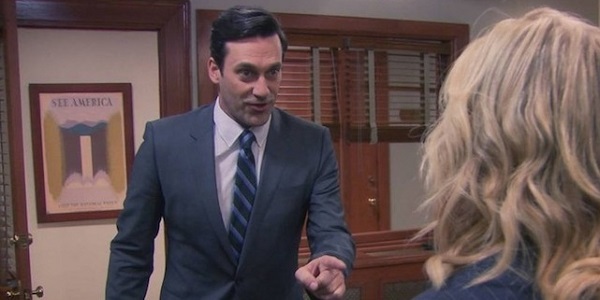 According to EW, Jon Hamm is confirmed to return as the exceedingly incompetent National Parks employee Ed, who was fired by Leslie in the Season 6 finale’s final minutes. (Watching Jon Hamm make mistakes could be a series all by itself.) Megan Mullally, the real-life wife of Nick Offerman, is coming back to wreck Ron’s life for a little while as Tammy II. Natalie Morales, who played the Snakehole bartender that Tom hooked up with for a few episodes, is also coming back. Showrunner Mike Schur hasn’t been very secretive about his mission to get as many recurring characters as possible for the show’s final season. Any episode with Ben Schwartz’s Jean-Ralphio and Jenny Slate’s Mona-Lisa is going to be my favorite one, no que-he-e-e-estion. Did that impression work in text form? Parks and Recreation is scheduled to debut its Season 7 at some point in the midseason, which probably means January or February of 2015. Let’s just hope Chris hasn’t become anything like Lowe’s alter ego from those DirecTV commercials, and that Justin Theroux returns as the super-cool Justin. He was dreamy, right?